• There is no need to panic – looking for apartments too early in New York doesn’t always work to your advantage. Because most of you will be looking for furnished short-term rentals, we recommend that start looking about two months before you plan on arriving to the city (unless you are planning on staying in a student housing, in which case they are able to organize beds much earlier). New York is a city where you can easily find an apartment / room to rent – as long as (and this is important) you are flexible, can make a fast decision and you are not too picky! • In our experience, most students are not ready to commit to their accommodation once they arrive and experience it. Every semester, there are a lot of unhappy stories about location and space in the apartment. If you are even slightly unsure, the best plan for you would be to keep yourself flexible – rent a room or apartment for 2 to 3 weeks and start searching for apartments or rooms after you arrive in New York. This way, you can see the room in person and it makes the process easier. However, this option means that you are taking a bit of a risk that you must find a place in that short time. Every option is not perfect but if you educate yourself, it will work out! It is important to not make financial transactions before being very sure. If you would like to already make a decision check out the listings available on our blog and get in touch with our preferred vendors (some of them offer discounts to our students). Our most trusted partner since 2016 has been Sublet4U. We recommend that you get in touch with Ms. Barlage or Mr. Lemberg for options that would be available for you. You might also want to read this article on Time Out New York for their recommendations for long-stay options. If you are renting rooms or apartments from Germany be prepared to be surprised at how small the space actually is. In New York City, location is everything and you can pay a lot for something that is very small but in an ideal location (close to subways). Living in Manhattan (called ‘the city’) is the most expensive (average rent is $1,535). If you want to save money on rent, check out the other boroughs – Brooklyn, Queens, Staten Island and perhaps even New Jersey! Click on the image for an approx. 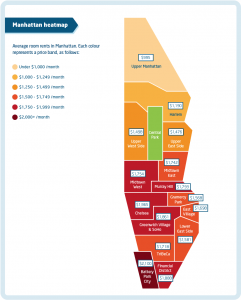 price for each neighborhood in Manhattan. We have tried to make sense of the various New York neighborhoods for you. Try to think of the travel and the distance to the train station as the most important factor. Also check out this list of the 10 Best NYC neighborhoods for students! Bronx: The Bronx is a relatively inexpensive area but we do not recommend that you consider this borough first. The most important reason being that you can easily choose the complicated option (which means travel by bus and train) here and be tempted by the cheaper rents. You want to feel safe in the evenings and night and not be ‘lost’! If you are convinced you want to stay in the Bronx, rent an apartment through AirBnB or a similar website for 1 week or 2 weeks first to get a practical idea. Downtown Brooklyn: There are many options available in downtown Brooklyn and even going ‘as far as’ Crown Heights might be good. Just be careful to check that any apartment you rent is within 5 to 10 mins walking to the subway station. East Harlem: In the past, people recommended that you should not look at apartments above 110th Street. However, the area has gotten safer and the rents are lower than in the rest of Manhattan. East Harlem is known for being Spanish Harlem which can get a bit loud in the night time. Upper East Side: Traditionally an expensive area to live in but certain blocks in that area are cheaper (around 90th Street). We recommend you search here first because this is a nice place for the weekends, well connected, and easy to get back and forth from university. Midtown: The benefit of living in midtown east or midtown west is that you are close to everything you want to be close to. However, it is very busy with tourists and other crowded events. In the past semesters, midtown has been the most popular destination for our students as it is easy to get to university and walk everywhere. Check out apartments close to 1st Avenue and 2nd Avenue in the 40’s and also all the way on the west side in Hell’s Kitchen. Greenwich Village & SoHo: Home to famous musicians and actors, this area is very trendy but also has some college housing for NYU is also here. Very student friendly area around Washington Square Park but the rents are not cheap. You have a bustling night life with cool bars and after hour eateries. Financial District: During the day, it is really busy but at night the district turns into a very quiet area. Just a bit north of the FiDi (neighborhood name) is TriBeCa which is often considered the most expensive property of New York City (even more than the Upper East Side in many cases). This line goes through Bronx and Harlem and then goes down to midtown and branches to Queens and Brooklyn – Williamsburg, Bushwick, Dumbo, Cobble Hills. You can look at the distances and the approx rent prices from the 4, 5, 6 subway line for some of the neighborhoods. Upper West Side: The UWS is a family friendly neighborhood with access to cultural institutions and art (which is of course not restricted to only this area!) Traditionally areas around Columbia University would be less expensive and easy to travel / commute from. We recommend looking here! East Village: This has been a very popular destinations for student housing next to Brooklyn. Queens: Consider living in Astoria, Long Island City. Also check out Roosevelt Island for options. This line goes through the east side of Manhattan and Queens down to midtown and then all the way to Brooklyn. You can look at the distances and the approx rent prices from the 4, 5, 6 subway line for some of the neighborhoods. The 1, 2, 3, subway lines are the red trains which go through the west side of Manhattan and down to Brooklyn. This is one of the main arteries of the subway map similar to the 4, 5, 6 trains. You can look at various neighborhoods on this line like West Harlem, Harlem, UWS, Hell’s Kitchen, Chelsea and in Brooklyn you can look at downtown Brooklyn, Prospect Heights, Crown Heights. Washington Heights: This neighborhood is on the top of the island of Manhattan. It is bordered by Harlem in the south. Tribeca: This area is getting more expensive over the years. But sometimes you can still find good offers/deals for an room. Staten Island: Staten Island is a relatively under-the-radar borough. The ferry is 24/7 and every half an hour. The travel time is 25 minutes and the service of ferry is free. However, it is quite far from the ferry terminal to midtown. Look at google maps to explore your travel! New Jersey: If you plan to live in New Jersey you should have in mind that you need a second metro card which would be for a month approximately 120$ extra. As an advice find an apartment close to the path subway that takes you to 33 Street or the bus that takes to Port authority. It’s easier to commute to Manhattan every day that way. If you live close to the train or bus station that takes you to Port Authority or 33th Street and you have most of your classes in Midtown you may not need an extra Metro card because you can walk! The path train is every 10 minutes during the day to half an hour at night. The NJ Transit is the Bus that takes you to New Jersey. During the day, the bus will arrive every 10-15 minutes but at night it will only be available every half an hour to one hour.